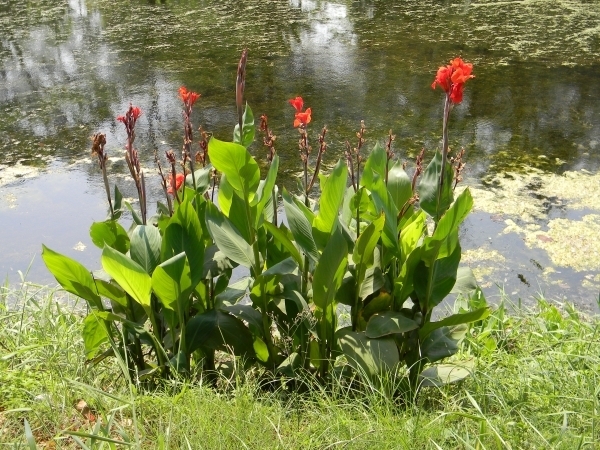 Water Canna are bog plants originally from Louisiana that grow tall and have bigger leaves that resemble banana leaves. They are popular in water gardens due to their foliage and flowers, which can come in yellow, orange, red, pink, peach and orange. They are tropical by nature and should be brought indoors during the cold seasons. Below are some basic paremeters for keeping Water Cannas in ponds. Water Cannas should be planted in pots in water that is no higher than a foot from the top of the container. Due to their larger leaves, they tend to fall easily in windy conditions. Therefore, make sure to place them in your pond so that they won’t be affect as much by wind by anchoring the pots in which they are planted.